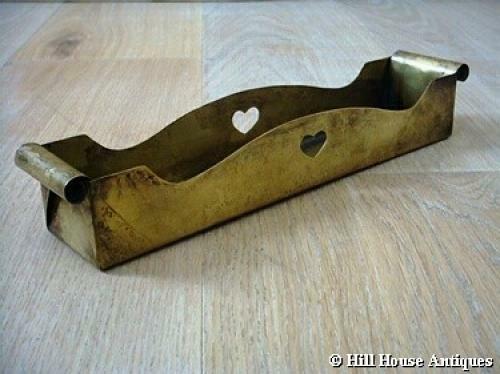 A rare Arts & Crafts brass pen tray (handmade from one piece of metal) with typical heart cut-outs to central panel sides and scrolled at each end; designed by CFA Voysey c1901-03 and made by the metalworker and fellow Art Workers Guild member, HJL Masse. The pen tray was exhibited in the Arts & Crafts Exhibition Society`s exhibition of 1903 (see The Studio Vol 28). An example is in the collection of the British Museum in London. A similar pen tray was also exhibited in the Batsford Gallery, London in 1931, showcasing Voysey`s work. Approx 11.25" long, 2.25" wide and 2" high.